The mood was melancholy on this Monday night matchup as the Houston Texans mourn the loss of their owner Robert C. McNair. The Houston Texans honored their owner by keeping the winning streak alive. DeShaun Watson threw two touchdown passes and ran for another score as the Texans set a franchise record with their 8th straight Victory, 34 - 17 over the Tennessee Titans. Demaryius Thomas got involved in the offense taken advantage of Titans quarterback Leshaun Sims who replace Malcolm Butler (concussion). He scored his first two touchdowns with Houston and Lamar Miller ran for 162 yards including a 97 yard touchdown. The Texans exerted their physical dominance in this game and had a tremendous performance with their offensive line. As a result of the Texans physical statement they were able to stop Tennessee on 4th and goal and on the ensuing drive the running back Lamar Miller went crazy. Brilliant work by the offensive line and a block by Julien Davenport open a seam that Lamar Miller took 97 yards to the touchdown. The Texans fell behind 10-0, but was able to run off 27 straight points and totally dominated the Titans. Running the ball collectively with Miller, Blue, and even Watson getting those scramble yards when protection breaks down. Obviously the game plan for the Texans was to stop Titans running back Dion Lewis. The defense held them to 8 yards rushing and 33 in the passing game. Furthermore, Lewis, Derrick Henry, and Marcus Mariota accounted for just 66 yards rushing on 22 carries.The Texans ran for 281 yards on the ground. Titans quarterback Marcus Mariota was 22 of 23 for 303 yards, but he suffered six sacks on the night as a result of rush / coverage working together extremely well. Christian Covington has found his stride this season, but last night was his best performance. He had 3 sacks but will be credited with only 2.5. Covington and finished with four tackles, 2.5 sacks, two tackles for a loss and three quarterback hits. The defense did its job basically the whole night, besides two big plays by the Titans. Two touchdown passes 161 yards and the other 48 yards was basically blown coverage and missed tackles. 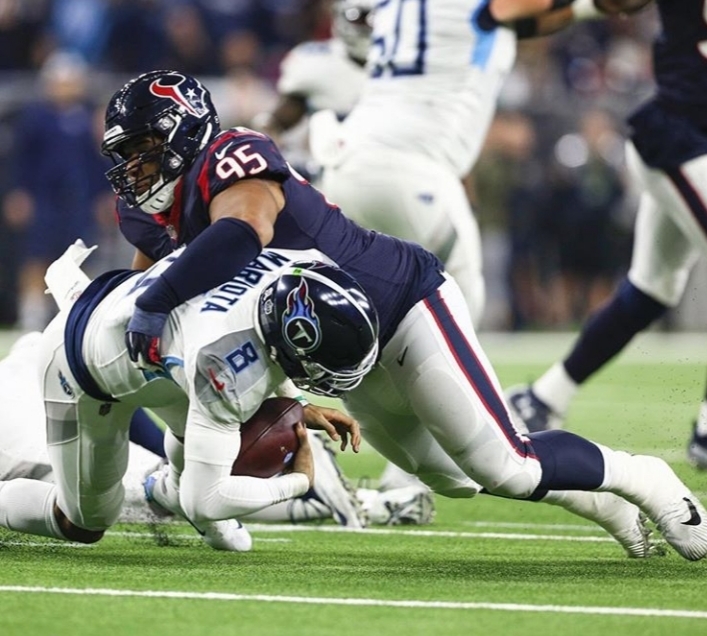 6 sacks and 10 tackles for loss made Tennessee's offense very dormant after Marcus Mariota had a couple of scrambles in the first half, Romeo Crennel used Jadeveon Clowney to spy on him. J.J. Watt's stat line was very impressive. He had nine tackles, 1.5 sacks, one tackle for a loss, two quarterback hits and one forced fumble. That's a football playing dude having a dude night. I loved the call on Deshaun Watson's rushing touchdown in the second quarter. I've seen a ton of college teams run that same play or a version of that play and the Texans ran it to perfection. Tight ends Jordan Thomas and Ryan Griffin had great blocks on that play to open up a huge lane for Watson to find the end zone. The Cleveland Browns are next on the schedule and their hot and ready to make a statement next Sunday. Kickoff is 12 noon at NRG Stadium.